The Bouvier is a large, powerful, rugged-looking dog. The head is in proportion to the body, giving the dog a square profile. The broad, somewhat short back has a firm, level topline. The head is flat, slightly longer than it is wide. The skull is parallel with the muzzle, which is wide between the ears. The muzzle is slightly tapered, broad and strong. The nose is black. The bushy eyebrows make the stop more pronounced than it really is. The teeth meet in a scissors bite. The dark brown eyes are oval in shape with black eye rims. The triangular ears are set high, either cropped or left natural. The well-muscled back legs are powerful and the front legs are straight. The tail is set high and usually docked. Note: it is illegal to crop or dock a dog's body parts (tail and ears) in most parts of Europe. Dewclaws are usually removed. The double coat is weather-resistant with rough, harsh outer hairs. The undercoat is fine and soft but dense. 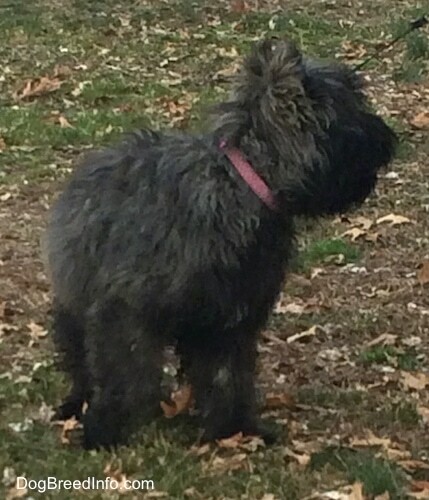 The coat is cut so it has a shaggy, thick beard and eyebrows, giving the dog a distinctive look. Coat colors come in black, fawn, blonde, salt and pepper, gray or brindle. Sometimes it has a small white star on the chest. 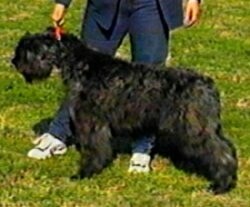 Solid black coats are not favored in the show ring, but are accepted and blonde coats are not accepted. Dutch bloodlines are often larger and heavier than Belgian lines. 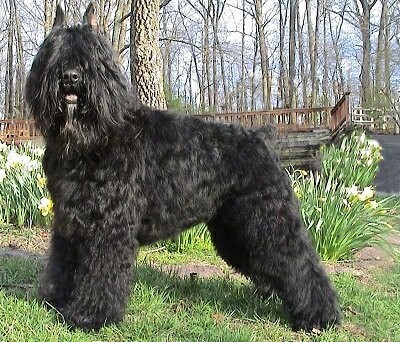 The Bouvier des Flandres is an obedient dog that may look intimidating, but is actually pleasant natured and gentle. With the proper amount of exercise it will also be calm. Enthusiastic, responsible, even tempered and fearless, it is an excellent guard and watchdog that is easy to train. This breed learns commands relatively fast, though not quite as fast as, for example the German Shepherd. They require well-balanced training that remains consistent in nature. Once they learn a command they will remember it for the rest of their life. It is important to consistently make the dog aware, without being harsh or rough, that you are and will remain the boss. This breed needs an experienced owner to prevent dominance and over-protectiveness problems. He should be socialized well, preferably starting at an early age to avoid shyness, suspiciousness, and reservations with strangers. Protection of the family when danger is present is not something that needs to be taught, nor is it something you can train out of them. The dog will arise to the occasion if needed. 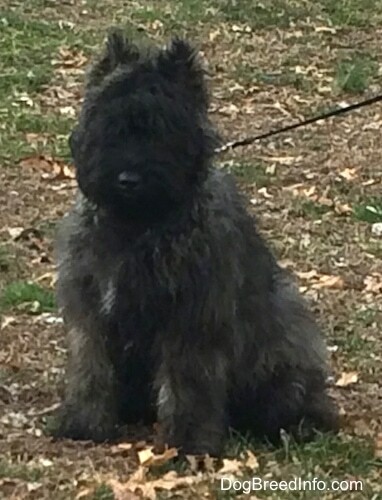 A good family dog, the Bouvier likes and is excellent with children. 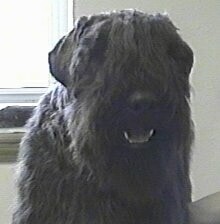 The Bouvier is very adaptable and goes about its business quietly and calmly. This dog's loyalty is world famous. Obedience train this breed at an early age. Their behavior in general and with other animals depends on the owners’ ability to be alpha over the dog, communicating what is expected and the individual dominancy level of the dog. 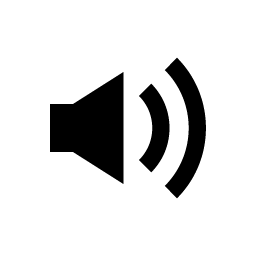 Provided they are properly socialized at an early age, chances are they will get along well with cats and other pets, but take caution with non-canine pets. They are usually good with other dogs if they are raised with them from puppyhood. More dominant individuals can be dog-aggressive if the owners are not alpha and do not communicate to the dog that fighting is unwanted. Slow to mature in both mind and body, taking about 2-3 years. Prone to hip dysplasia, eye problems such as cataracts. The Bouvier has a very high pain threshold. They can take a lot of contact with the cattle's legs without feeling it. This does not make them a veterinarian's favorite patient, as they cannot tell where the dog is hurting by manipulating the legs and/or other body parts. Tends to pass gas. There is no real agreement concerning the origin of this Franco-Belgian breed. It may have been formed by crossing the Griffon and the Beauceron. The breed originated in Belgium by the working class who were not interested in creating a show dog, but rather wanted a working dog. Farmers, butchers and cattle merchants used the dogs in their everyday work. 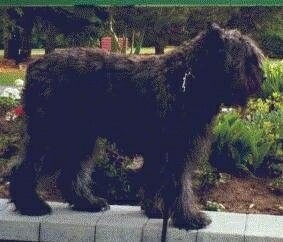 While the dogs varied in size and look, they still were similar enough to recognize them as a Bouvier. 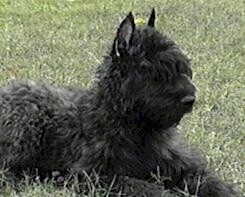 Bouvier des Flandres means "cowherd from Flanders." The dogs were labeled several nicknames as well, such as "koehond" (meaning cow dog), "Vuilbaard" (meaning dirty beard) and "toucheur de boeuf" or "pic" (meaning cattle driver). Later they were used as a message-carrier and rescue dog during World War I. Like most breeds during the world wars, the Bouvier was almost killed off. In 1923 a group of individuals worked at recreating the Bouvier breed and a breed club was formed in Belgium. 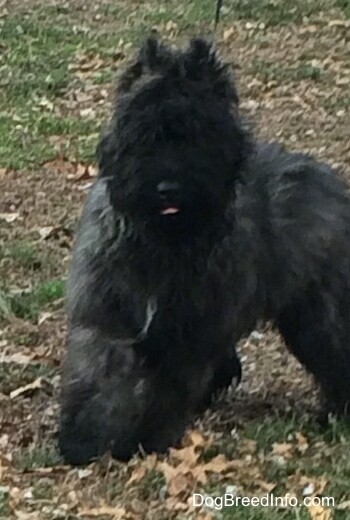 Some of the Bouvier talents are watchdog, guardian, tracking dog, guide for the blind, search and rescue, police work, military work, carting, agility, competitive obedience and Schutzhund. 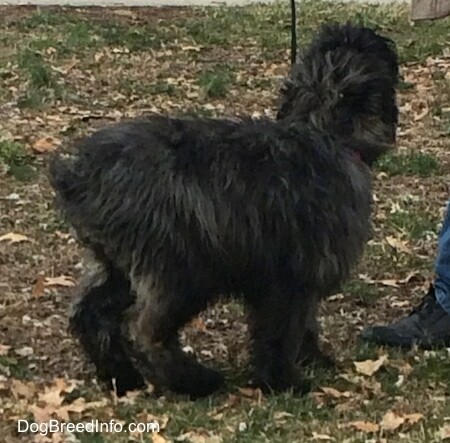 Diesel the blonde Bouvier—"I took this photo of my 4-1/2-year-old, neutered male BdF. His name is Diesel and he is the sweetest boy ever—a real teddy bear. He’s a very laid-back dog but doesn’t hesitate to protect us if he senses a threat. He loves his ‘sisters,’ a female Australian Terrier and a female Miniature Poodle (who is the boss and that’s fine with Diesel). He does NOT like cats. Diesel’s favorite things to do are swimming in the ocean, running on the beach, and playing ‘chase’ in our backyard (I’m the chaser; he’s the chasee). He also loves to snuggle on the bed with us and tries to take up as little room as possible. I walk Diesel everyday for at least an hour—longer on the weekends when he enjoys a strenuous 2-hour hike up a mountain. He’s particularly bonded to me (mom) but he likes everyone, including children. He requires a good combing-out at least every other day. The only bad thing about him is his flatulence. Yes, he’s a VERY gassy boy (hence his name) and can clear a room in no time. I think people should be aware of this before purchasing a BdF as this is a common thing with this breed. You REALLY have to love your dog to put up with the stink!" 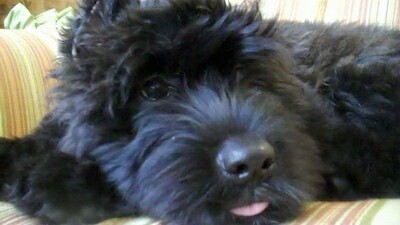 "Willow the Bouvier puppy at 14 weeks old is already in training to be a therapy/agility dog. Oh, and she's the cutest puppy in the world. Check her out!" 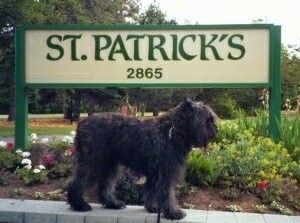 "Dixie is a silver brindle Bouvier des Flandres at 30 inches and a trim 125 pounds at 9 years of age. I have never seen or owned such a calm, even-tempered dog like this girl. She is wonderful with children, other dogs and farm animals; however, cats and rodents she pursues for culinary purposes only! She is highly protective of house and property, yet is a model dependable dog when in public at the family business. She sheds little, but the coat does require much care as it mats constantly and like Velcro picks up everything! She is highly intelligent, very prey driven, strong and stubborn which all make Bouviers a dog more suited to an experienced handler. This is the dog that doesn't care what she wears or where she goes as long as it is by my side. She lives life to the fullest with gusto and makes her younger King Shepherd sister look like the fine Lady of the Manor!" 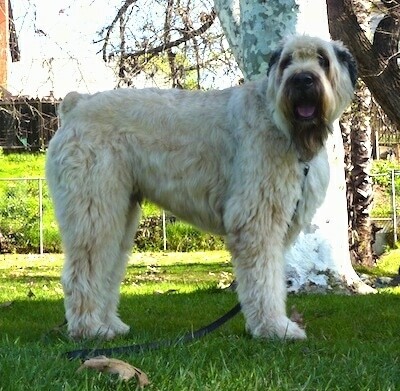 Nani the blonde Bouvier; blonde Bouviers are born dark and lighten from the bottom up as they get older.